Bundled together in fifteen dense chapters and an epilogue is a confluence of geography, demographics, history, economics and geopolitics. But more than dry, dusty facts and figures is an education! This is one of the reasons we were supposed to stay awake and pay attention while taking those classes in secondary school and college! Oh, now I get it! 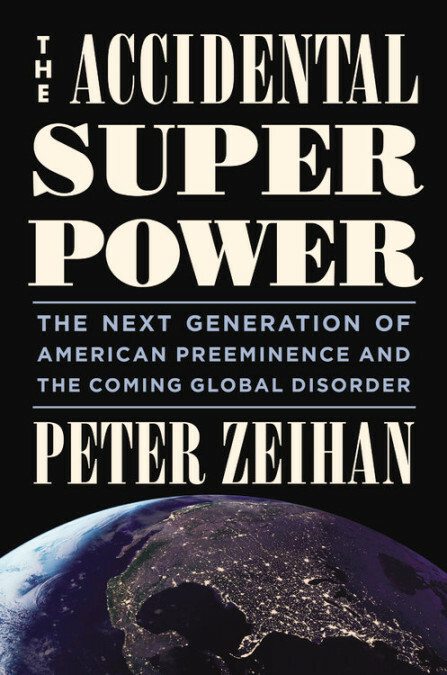 And so Peter Zeihan, a geopolitical strategist who has worked for the US State Department in Australia, the DC think tank community, helped develop the analytical models for Stratfor, and started his own firm – Zeihan on Geopolitics – has handed off to readers a thoughtful learning-experience in his 384 page hardback, “The Accidental Superpower: The Next Generation of American Preeminence and the Coming Global Disorder”. This tome exhibits why we were forced to sit through those classes and expected to grasp their content: all together they all matter! Therefore this is not a book of “recommendations on what” the author thinks “should happen” but “predictions about what will happen” (v). Since there are hundreds of reviews of the book already splattered across the internet, I’ll simply focus on its main emphasis, and why this book is important. Zeihan starts out with his major thesis – geography counts, therefore the “trick is to begin with geography and see where it takes you; don’t start with a theory and use geography to justify it” (Ibid.). That means that geopolitics is a significant tool, since it is a “study of how place matters” (8). Thus, as the author works his way through the seven continents and their history, he builds a case for why America became an accidental superpower, and will remain one for many years to come. Zeihan also shows the ways in which America made a safer world through its World War Two era Bretton Woods guarantees that were “firmly rooted in the United States’ unique strengths: a singular combination of geography, industry, and technological development that constituted the primary source of American power” (5). Because of Bretton Woods, America relieved many nations from the need to pour monies and manpower into building huge defenses and navies to secure their territories and transports or invade other nations to secure necessities. And so for the past 70 years there has been a world-wide historical vacation for most of the planet. But those days are coming to an end, according to the author, and the result will be traumatic for many nations. Not only will there be an end to the international free trade order, but most countries’ demographics (aging populations with less and less younger people to prop up their industrial and economic apparatuses) will fight against them as well. The crucial years will be 2015 through 2030. Yet America will still remain the dominant power for the numerous reasons charted out in the book. What I enjoyed about the book was that it was not a chicken-little-the-sky-is-falling dystopian work. Rather, pursuing outcomes based on the confluence of geography, demographics, history, economics and geopolitics takes away the ideological and emotional edge. Further, it was an education in all of those subjects, and their significance in discerning what is happening now and what are the trends for the future. I found it interesting that the book was written in 2014, and some of the foreseeable events Zeihan mentioned (Ukraine and Russia, Syria, Greece, and so forth, just to name a few) have now begun to play out in 2018. “The Accidental Superpower” is worth the time to read and think through. It will give the reader a bigger frame of reference for viewing what is presently happening on the global scene and why. I think this book is a keeper, and will be one referred back to over the next few decades. You may not agree with all of the author’s analysis, but in the end, you will find it helpful and instructive. This volume should be read by anyone who wants a glimpse into what will likely be coming (and is already starting to come). It also needs to find its way into High School and College classes, if for no other reason than as an illustration of the significance of geography, economics, history, demographics and geopolitics, and how those disciplines can team up and work together. I highly recommend this book! And now I am ready to jump into his second volume, “The Absent Superpower”. I can’t wait! Thanks to the author for providing, upon my request, the free copy of “The Accidental Superpower” used for this review. The assessments are mine given without restrictions or requirements (as per Federal Trade Commission’s 16 CFR, Part 255).